In 1989, at age 40, my Dad ran a 2:48 at the Houston marathon to qualify for Boston. I was 13 years old at the time, and I remember spectating the race with Mom and Adam. 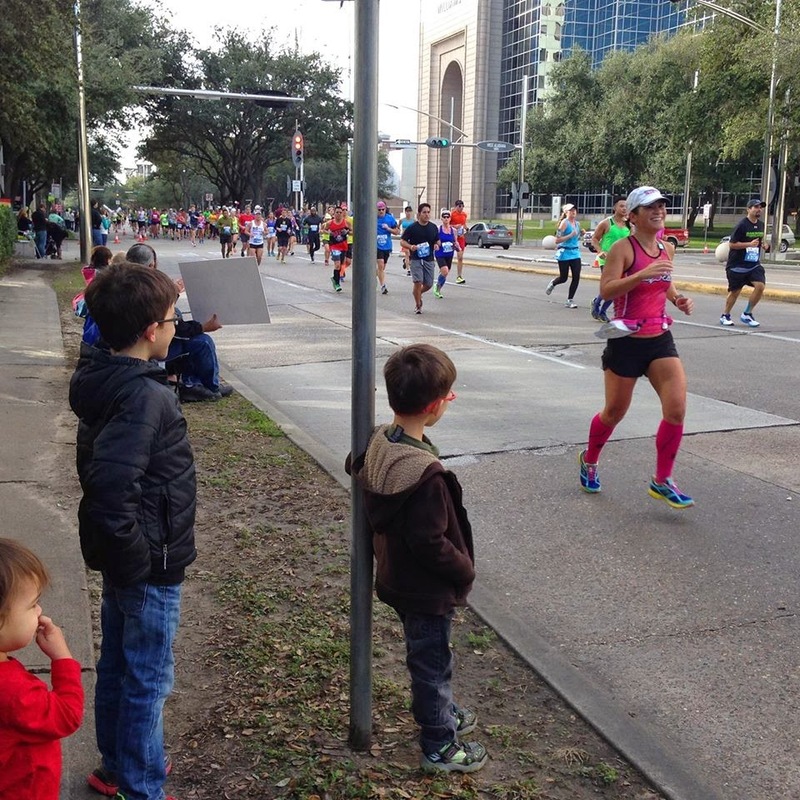 Mom dragged two reluctant kids all over downtown Houston to provide cheers and support for Dad along the course. I was unimpressed with the entire situation, typical for my age, but I remember how Mom rushed us from mile marker to mile marker, offering relentless support to Dad as he went flying by. I also remember Dad's spectacular collapse at the finish line - the first time I ever saw him as anything other than strong and tough; my usually stoic father showed such emotion as he greeted Mom after reaching his goal. Those are pretty big shoes to fill. To be honest, for years I never even considered the possibility of a BQ. I've been a 10-minute-mile runner forever. Then, last winter, something happened. A question snuck into my mind and eventually I became brave enough to say it out loud to Dawn. 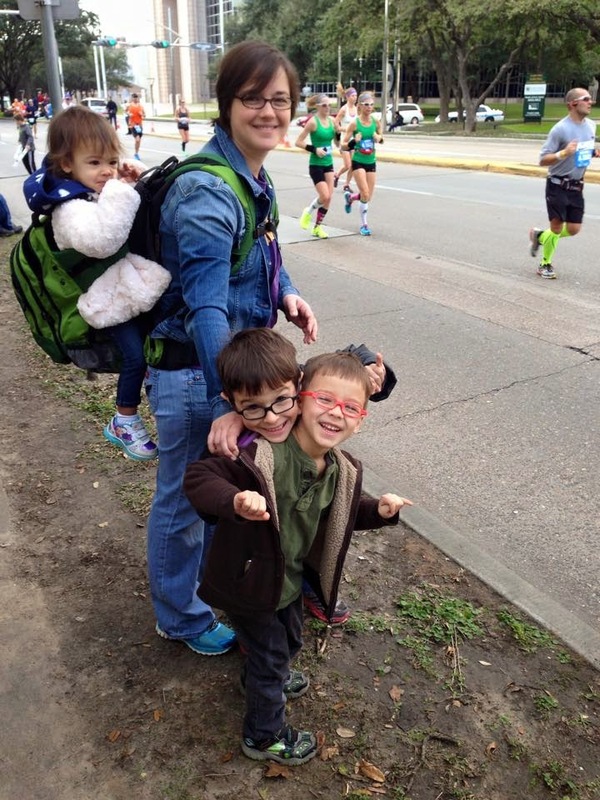 "Do you think I can improve my running enough in two years to qualify for Boston at age 40? Because it would be really cool to do that at the Houston marathon and (literally) follow in my Dad's footsteps." At the time, I had completed 5 marathons. My PR was a 4:46. I'd need to take an hour off my best time to get the 3:45 I'd need to qualify for Boston. Was I being ridiculous? Here's why I love Dawn - she immediately and confidently replied, "YES, OF COURSE YOU CAN." And I started to really consider it. A year went by and some confidence was built and I raced in San Antonio in December 2014 and went sub-4 for the first time. I'd need 12 more minutes to make that BQ time. 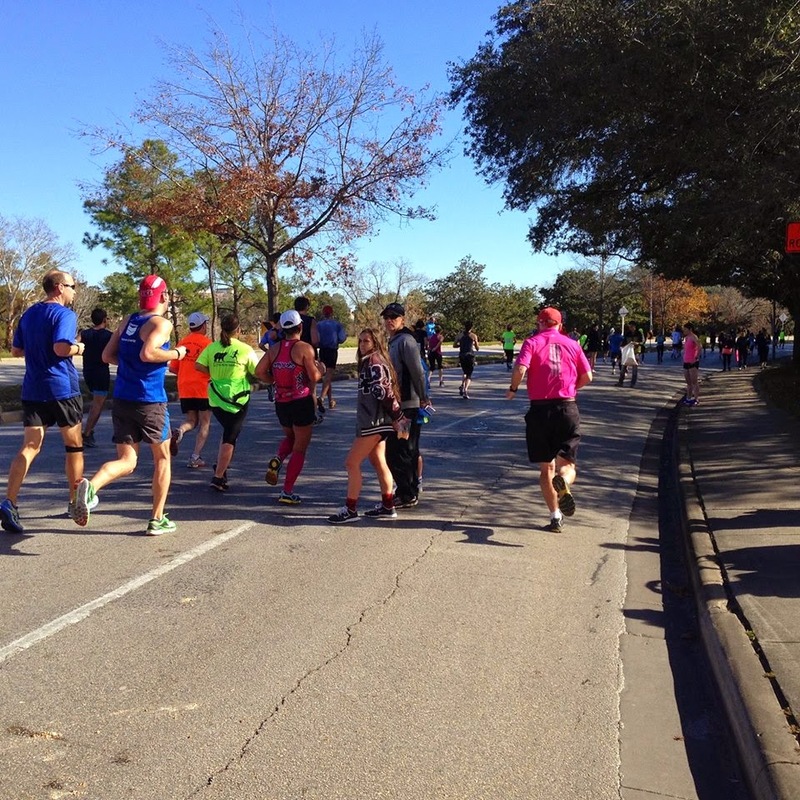 The Houston marathon was coming up in just 6 weeks. I started to believe that I could do it, although I didn't really "have to" until next year, to make the magic "BQ at 40 in Houston" goal. When I lined up to race last Sunday, my entire family was there to support me. Mom and Dad were there. Adam and Jen and their adorable children had driven in from Louisiana and were going to be on the course cheering. Because this was Dad's race course and a part of our family's history, this was a big deal for me. It was emotional. And I was going to go for it. Hazel, Jen, William, and Henry waiting at Mile 15. It was weird to stand in the corral at a start line by myself. No Shelly or the girls. Just me and my goal, and a note written on my hand with a Sharpie, "How bad do you want it?" (Thank you Bree). As teammate Trent passed me in the first mile of the race in pursuit of his own BQ, I looked at my hand for the hundredth time, picked up my shoulders, and went for it. I raced my heart out, I ran at the intended pace for 17 miles, and then began the inevitable fade. I'd find myself falling off the pace and then struggling to turn my feet over faster to pick it up again. Even with the bottle of Coke that my amazing friend Rene provided at mile 21, I couldn't keep up the pace, but I tried my very best. I am so proud of this race. I didn't qualify for Boston. With a 3:52 finish, I did chip 5 minutes off my time. I'll make a Smart Plan to make the whole dream come true next January in Houston when I'm 40 - I've already signed up for the race. I need to find 7 minutes to make that BQ time. I know that I can do it. Although I didn't reach my goal, the race was incredible. A gorgeous course with hundreds of thousands of screaming spectators, ridiculously well organized and supported, with perfect weather. I'll recommend this race to everyone; it was so much fun. Even with thick crowds and the relentless pounding of a flat course that ends with 3 miles of punishing hills (yes, there are hills in downtown Houston, I didn't believe it either). The joy at this race was in sharing it with my family. At multiple points along the way, they were there yelling support and providing "Pinky 5's," a salute invented on race day by my ridiculously cute nephews. When I saw them for the first time at mile 15, I lost my composure for a few minutes afterwards and had to gasp for breath as I tried to stop crying. I was following in my Dad's footsteps while chasing my own dream and they were all there sharing it with me - it was overwhelming. It was similarly emotional to have Dad run alongside me as they caught me again at mile 23. Our conversation went like this: "You're doing great." "I'm not going to make my goal, but it's okay, I'm going to PR." "You're not far off your goal." "I know. I just need to learn how to be in pain for 10 miles. I'll get it." (That's an example of a ridiculous change in mindset - I'm beginning to crave that pain, as Dawn says). And then I ran off to finish the race. Running with Dad on the Houston Marathon course. Pretty amazing (He's far right, in Pink, on purpose). My Dad has always been the Real Runner in the family. He's been in my corner for as long as I've been doing this, but now something has changed. He's coaching me, giving me advice; he really believes I can qualify for Boston, which means he thinks I'm a Real Runner too. Somewhere along the way, I'm going to believe it as well. Houston 2016 is a year away, and I'll be ready. The other day, I was talking with a coworker that I've been informally coaching for over a year as he's transformed himself into a pretty good runner. Vincent reminded me of something that I told him a while back that I didn't even remember saying - "Just go for it. What's the worst that can happen?" He told me that on a 20 mile run last weekend, as he picked up the pace, he thought to himself, "the worst thing that will happen is that my wife will have to come and pick me up." As a result, he ran faster than he's ever run before, because he got rid of fear. I've posted quite a few times about putting fear aside and going for it. But having a goal of a BQ at the Houston marathon in a few weeks brings up a whole new level of scary, turbulent fear. What if I fail? What if I hurt myself? ...what if I give up? There's such an enormous contrast between how I feel as a runner and how I feel as a swimmer. I will confidently tell you, "I am a swimmer." Between swimming, biking, and running, I'm definitely best at swimming. Because it's what I'm good at, it's what I love - I mean LOVE. Love it so much that I'll ask my coach for a 100x100 swim for my birthday. Love it so much that I will fearlessly set big goals for a timed event. Love it so much that when I see a difficult set on my workout plan, my thought is "cool! Let me see if I can do this," not (as I do when I see a similar running workout), "crap, I hope I don't fail." The confidence and joy that I feel in swimming allows me to push through one difficult workout after the next, which, of course, builds strength and makes me faster, which provides more confidence and joy. Clearly, this is a pattern. So how to translate it to running? How do I run with confidence, when in the back of my mind, I'm always saying, "what if I fail?" This morning, I happily swam to a new PR for the hour swim at Monica's Mile - 3800 yards, which is 200 more than last year. I felt physically sick for the rest of the day because of the effort I put into the swim. But I still had a 2.5 hour run to do, with goal paces that I was supposed to reach. Ugggggg. I put off the run until I realized that I'd run (haha) out of daylight to do it. Then I headed out on an out-and-back route in which I was supposed to start out slowish and then hold a 9 minute mile pace or better for the last hour and a half...on a false flat, into a huge headwind. I went out too fast. My first few miles were at an 8:45ish pace. I thought about my own advice that Vincent had repeated back to me. What's the worst that can happen? (Well, I could end up an hour and 15 minutes away from my car, walking, and it could get dark, and I could get murdered. But we won't think about that.) I made an effort to just go for it and see what happened. I forced myself to be confident. I embraced the challenge and chose to run like I swim. I bet you can guess what happened next (or I wouldn't be blogging about it - ha)...I held the pace I started with. I even ran a negative split on the way back! Talk about a confidence builder. What's the worst that can happen? My answer: you can finish this race knowing you didn't try your best. Whatever happens in Houston, I vow to run with confidence, even if I have to remind myself every mile to run like I'm swimming. I might even start to tell you confidently, "I am a runner." And I'll re-read this post a thousand times in the next couple of weeks to remind myself. Super happy fun times at my 100x100 birthday swim - thanks to the lovely ladies, Dawn, Michelle, and Linda for joining me on Christmas Day to swim! Some of the Tri-Belief crew (although no matchy suits this year) - Trent, Orissa, Linda, me, and Shelly at Monica's Mile, year 3! An awesome event, as always. A thousand thank yous to Bree Soileau for timing me today! 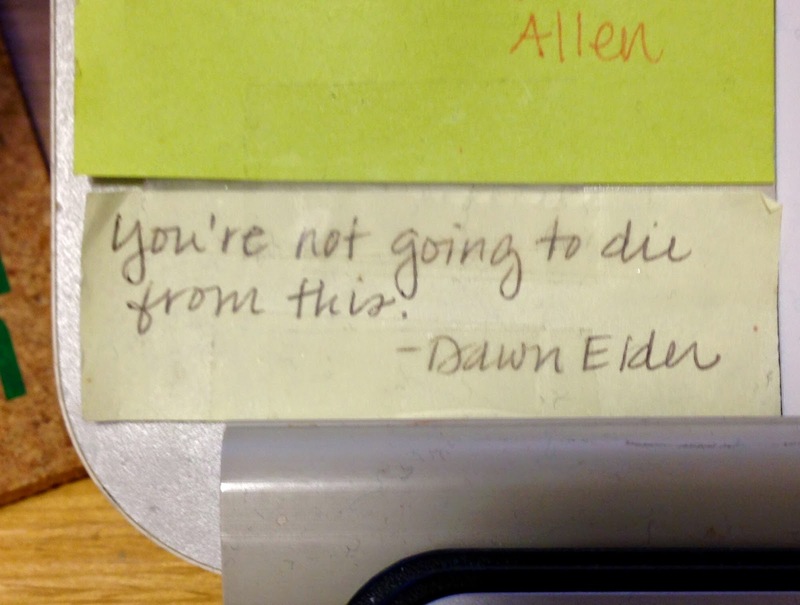 Dawn's version of "don't be afraid." This has been on my desk at work since 2011 when, during marathon training, Shelly and I asked "what's the worst that could happen?" for the first time.